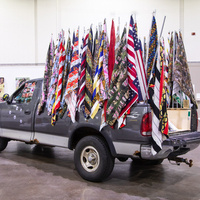 The Maryland Institute College of Art and the For Freedoms 50 State Initiative present Everyday, Everyday, Everyday, Everyday Freedoms, an exhibition that reimagines civic engagement beyond voting in elections. This group exhibition considers how a democracy could be free from disenfranchisement; forming a critique of the frayed political climate from a multiplicity of perspectives. Featuring local, national, and international artists at all stages of their careers, their artwork frames participation and activism through photography, vid- eo, game design, sculpture, installation, data visualization, text, and textiles. Citizenship, race, gender, age, and socioeconomic class exacerbate the inability of some to survive, let alone to engage civically. Beyond critiquing these systemic barriers, the curators prioritize art’s ability to change per- spectives through dialogue, collaboration, and social engagement. They imagine freedom as a release from partisan ideology and encourage the viewer to consider civic engagement as an ongoing daily practice—one that is malleable and ripe for redefinition. Everyday, Everyday, Everyday, Everyday Freedoms is organized by the Curatorial Practice MFA Class of 2020—Andre Bradley, Rodrigo Carazas Portal, Hannah Davis, Ashley He, Imani Haynes, Sung-ah Kang, Eva Sailly, Nathalie von Veh, Minwen Wang, Tiffany Ward, and Aden Weisel; under the direction of José Ruiz, Di- rector of Curatorial Practice, and Gerald Ross, Director of Exhibitions.